The carefully crafted marketing campaign for the I-5 Rose Quarter Freeway widening project is adamant that you don’t call it an expansion. It’s an “improvement project” they say. We’re not widening the freeway, we’re just building auxiliary lanes. But that rationale evaporates when you understand that the traffic projections that justify the project (and allegedly minimize its environmental effects) appear to be based on the assumption that the region spends $3 billion (and likely a good deal more) to build a 12-lane Columbia River Crossing project. 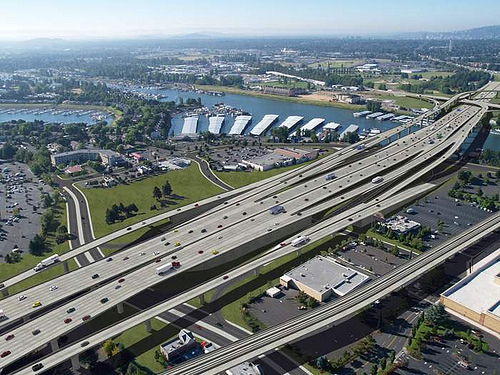 The modeling for the Rose Quarter Freeway expansion has hidden its assumption that the CRC gets built–and produces a flood of traffic into the Rose Quarter. Search the project’s Environmental Assessment (EA) and its traffic technical report, and you’ll find no mention of the Columbia River Crossing or the CRC. But there are a couple of very obscure passages in the Traffic Technical Report that deserve close scrutiny. Start with this seemingly innocuous statement buried 38 pages into the Traffic Technical Report . Notice, that there’s a lot of misdirection here: the EA draws our attention to the local street network and bike lanes. But local streets are just “one of the actions.” That naturally begs the question: What are the other actions? The EA doesn’t say. To find out, you have to follow the link buried in the footnote. If you click on the link in that footnote, you’re taken to an Excel spreadsheet hosted at the Metro website (it’s laid out in 8-point type, and the zoom is set by default to 50%), so you’ll want to enlarge it considerably to read what’s there. If you scroll through six hundred rows of the spreadsheet, on row 635, you’ll find this reference. That’s right: The environmental analysis for the Rose Quarter Freeway widening says, in the most indirect and obscure way imaginable, it is based on the assumption the region spends $3 billion on building the Columbia River Crossing (a 5-mile long, 12-lane wide freeway project between Portland and Vancouver). And critically, they’ve assumed that the CRC is part of the “No-Build” scenario for the Rose Quarter. There’s also quantitative evidence that ODOT built the CRC into its traffic forecasts for the Rose Quarter freeway widening project. This too was carefully concealed from public disclosure. As we noted, the Traffic Technical Report contains no references to Average Daily Traffic levels (the most basic measure of traffic volumes). After repeated requests to ODOT, on March 13, 2019, the agency released PDF images of several tables showing hourly traffic volumes on I-5. (Releasing them with just 18 days left in a 45-day comment period, of course, minimized public opportunity to evaluate ODOT’s data and claims). 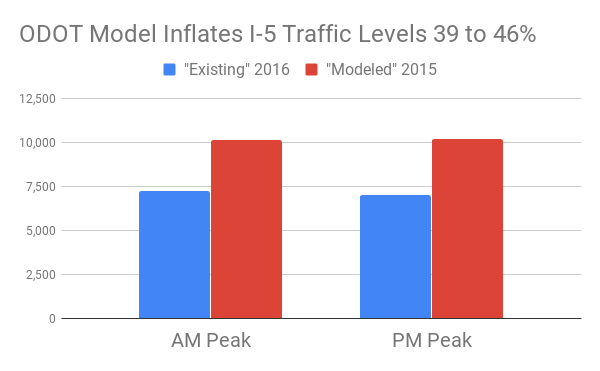 These data tables show peak hour traffic volumes at various locations on Interstate 5, and include data for existing (2016) levels of traffic and modeled 2015 and 2045 levels of traffic. Here is one of those tables, summarizing traffic in the morning (8AM to 9AM) and evening (5PM to 6PM) peak hours in both directions on I-5 at Going Avenue (the portion of the I-5 freeway at the northern end of the Rose Quarter Freeway widening project). We’ve shown two estimates: the modeled 2015 level of traffic in the No-Build (the top panel labeled “RQ VISUM Model 2015 No Build” and the reported existing levels of traffic (the bottom panel labeled “RQ Existing Conditions 2016”). The discrepancy to pay attention to here is the difference between 2016 existing traffic levels and modeled 2015 traffic levels. In theory, you might think that the numbers should be the same, or almost the same, and that, if anything, the 2016 numbers should be higher than the 2015 numbers, due to economic and population growth. But in fact, the modeled 2015 traffic volumes are uniformly higher–much higher–than the actual measured 2016 traffic volumes. What this means is that ODOT built a model of 2015 that assumes this area gets more traffic than it got in reality. There is no explanation in the EA, in the Traffic Technical Report, or in the materials submitted by ODOT on March 13 that explain this discrepancy. But what it represents is the effects of building a traffic model that assumes–quite counterfactually–that the CRC was built and operational in 2015, and funnelling roughly 3,000 more vehicles per hour in the peak hour into the Rose Quarter. The following chart summarizes differences between the actual level of traffic in 2016 (blue) and the estimates contained in ODOT’s model of 2015 conditions (red). ODOT’s model exaggerates the current level of traffic on I-5 by 39 percent in the morning peak hour and by 46 percent in the evening peak hour. While the Environmental Assessment and accompanying documents offer no explanation for this discrepancy, the only plausible explanation is that ODOT has assumed a massive increase in capacity and traffic on I-5 north of the project impact area–the 12-lane Columbia River Crossing. (Not only that, but they’ve apparently created a kind of alternative reality in which the CRC existed in 2015). There’s a very real unanswered question of how many vehicles per day ODOT assumed would be coming across the Columbia River in 2045. There are very different answers to that question depending on whether one believes ODOT’s own Final Environmental Impact Statement for the Columbia River Crossing or whether one believes ODOT’s subsequent Investment Grade Analysis–a traffic report done by independent experts to assess the impact of tolling on traffic. In the case of the FEIS, ODOT predicted that 180,000 vehicles per day would use I-5 in 2030 (the terminal year of its traffic forecast). 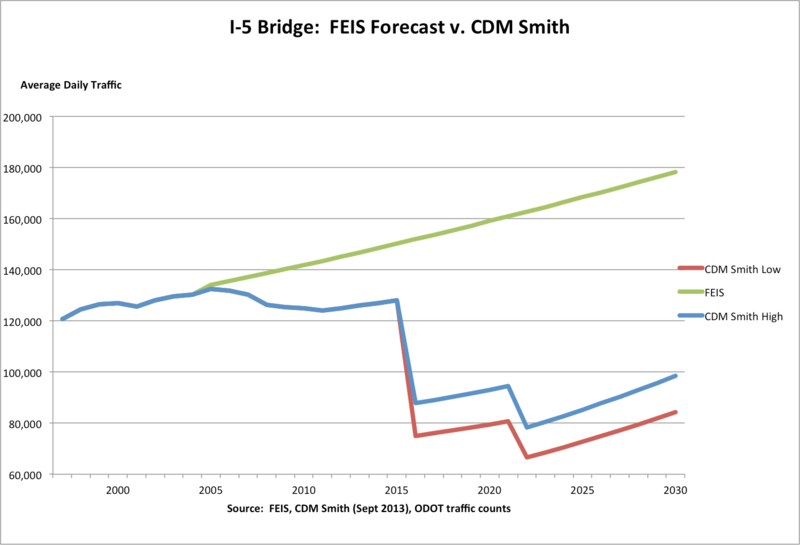 The Investment Grade Analysis, conducted for ODOT by CDM Smith concluded that even in it “high” scenario, tolls would dramatically reduce bridge traffic and that fewer than 100,000 vehicles would use in 2035–a number 20,000 to 30,000 lower than current traffic levels. Because the EA makes no direct mention of the CRC, and suppresses all data about average daily traffic, it’s impossible for the public to know which of these very disparate estimates (the FEIS estimate or the CDM Smith investment grade analysis estimate) or some other estimate was used to generate the modeled estimates of traffic flows into the Rose Quarter. The purpose of an Environmental Assessment or Environmental Impact Statement is to fully and fairly disclose the impacts a project will have on the environment. It’s important to remember that the National Environmental Policy Act is just a procedural law: it doesn’t prohibit you from doing things that change, or even hurt the environment. What it does do is insist that you honestly and accurately tell the public what those impacts are likely to be, and to give due consideration to reasonable alternatives that would likely have fewer impacts. The Rose Quarter Environmental Assessment does not meet that standard: it’s a biased and self-serving marketing document that conceals important facts from the public, constructs a phony No-Build scenario to put its impacts in a better light, and hides the most basic data about the projects traffic and environmental impacts. A fundamental premise of NEPA is that the agency consider a “No-Build” option: What will the environmental effects be if the agency doesn’t move forward with the project. It’s apparent that ODOT didn’t analyze a true “No-Build” scenario. It’s assumed that the Columbia River Crossing is built. The trouble is that project is, if not dead, certainly in limbo. Oregon and Washington spectacularly failed to agree on the project and funding more than five years ago. The project itself is still the subject of ongoing litigation (which like the project itself, is in limbo). The finances of the project were never fully worked out, and in the meantime, the expected sources of federal funding have essentially evaporated. Putting an imaginary $3 billion bridge, and its attendant traffic, in the “No-Build” scenario distorts the environmental assessment beyond reason. ODOT could remedy this by undertaking a new analysis that forecast traffic levels based on the actual no-build situation: a world in which the existing I-5 bridges provide six lanes of traffic across the Columbia River. Inflated “No-Build” traffic levels bias the environmental assessment. Assuming that there’s a 12-lane I-5 bridge of the Columbia River or otherwise inflating the assumed traffic level on I-5 north of the project area above the current level of traffic fictitiously creates a “No-Build” world of congestion and pollution levels that don’t, and can’t exist, and therefore casts the project in an artificially favorable light by comparison. A realistic No-Build, one which reflected actual traffic levels, and which left out the surge of traffic created by the modeler’s assumption that the CRC is built, would have much lower levels of congestion and pollution. In addition, as we’ve shown, the added capacity at the Rose Quarter would induce millions of miles of addtional vehicle travel that wouldn’t occur in the absence of the project, and which would increase pollution, congestion and carbon emissions. What ODOT has done is assume that we spend $3 billion to create a flood of traffic across a 12-lane Columbia River Crossing, and that this problem that is created is then “solved” by widening the freeway at the Rose Quarter. The rationale presented for the I-5 Rose Quarter widening project is the engineering equivalent of iatrogenic disease. (Iatrogenic is “doctor-caused” for example, when an otherwise healthy person undergoing surgery in a hospital acquires an antibiotic resistant infection). In this case, the quantitative justification for the Rose Quarter Freeway widening is to cope with the flood of induced traffic created by the construction of the Columbia River Crossing. This kind of modeling leads traffic engineers to a never ending game of whack-a-mole with traffic bottlenecks: you expand capacity in one location, that feeds more traffic into the bottleneck in the next location, and provides justification for expanding capacity at that location. The purpose of NEPA is to get decision makers to pause and reflect, and not allow a steady stream of seemingly minor and incremental decisions to systematically foreclose other, more environmentally sensitive options. Failing to break out the connected decisions to widen I-5 at the Rose Quarter and build the Columbia River Crossing, and to consider a the environmental effects of a world in which the region choose to do neither of these things, means that the EA fails to meet the NEPA requirement that it fairly consider the cumulative impacts of this investment decision. An honest cumulative impacts analysis would compare a world in which we built neither the Columbia River Crossing, nor widened the I-5 freeway at the Rose Quarter.You can’t judge the cumulative impacts of this decision, because ODOT hasn’t separated out a world in which just the Rose Quarter project is built. “Questions about the reasonableness of investment in the CRC bridge because unresolved issues remain to the south threaten the viability of the project.” (Independent Review Panel Report, 2010, page 112). The panel recommended further traffic studies to test whether the CRC will simply shift the bottleneck south, and called for ODOT and the City of Portland to “fully develop a solution for I-5 from I-405 to I-84” and to program that solution in conjunction with the phasing of the construction of the CRC (page 113). While its pitched as some kind of stand alone, safety related project affecting just a small area, the Rose Quarter freeway is really an integral part of a much larger, and entirely freeway-centric vision of transportation in the Portland area. It traffic projections are founded directly on the assumption that the region spends at least $3 billion, and likely a great deal more, to widen I-5 across the Columbia to 12 lanes. The project itself engineers a right-of-way through the Rose Quarter than can easily accomodate an eight-lane freeway. Yet these basic facts are purposefully concealed, and not revealed in the EIS. Nor does the EIS do its job of disclosing the likely cumulative impacts of these steps. Editor’s Note: This post was updated on March 27.